Advanced diagramming made simple. 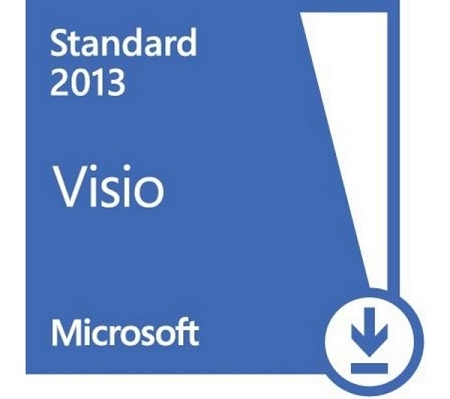 Visio Standard 2013 is designed for individuals who are looking for a powerful diagraming platform with a rich set of built-in stencils. It helps users to simplify complex information through simple, easy-to-understand diagrams. Visio Standard includes stencils for business and engineering diagrams, organization charts, basic flowcharts, and general multi-purpose diagrams. Create professional diagrams quickly: Create engaging diagrams in just a few clicks with updated shapes and new formatting options and tools. It's easier to start creating and customizing diagrams - Visio is packed with enhancements to make it easier to get started, find the stencils you want to use, and quickly get great-looking results with many built-in templates, many with updated shapes. You can also create and customize professional-looking diagrams using a set of expanded and improved effects and themes that apply a completely different design in just one or two clicks. Perform common tasks more easily - Diagrams are seldom static, so Visio makes it easier than ever to update your diagram with new shortcuts for frequently performed tasks. You can get to frequently used tools right away with a significantly improved quick-access floating toolbar and easily replace any shape (or combination of shapes) in a diagram while preserving your shape connections, shape metadata, and the overall layout. Create great-looking organization charts more easily - One of the most used templates in Visio—the organization chart—just got even better with several new styles—from professional to playful, which you can apply with just one click, the ability to import pictures and improved layout options to help fine tune the way your org chart looks.